The home that we are going to explore today is a wonderful example of how architecture works in harmony with the environment that surrounds it. Design professionals Home Style Toto designed this home so that it took full advantage of the riverside. This family home features views of the outdoors from almost every room, ensuring that the interiors are constantly connected to the exterior space. What is most striking about this home, however, is how the raw materials including stone, brick and wood work together to create a very rustic, earthy and modern home that is simply pleasing. From the outside of the home, we can see just how gorgeous and striking it is. 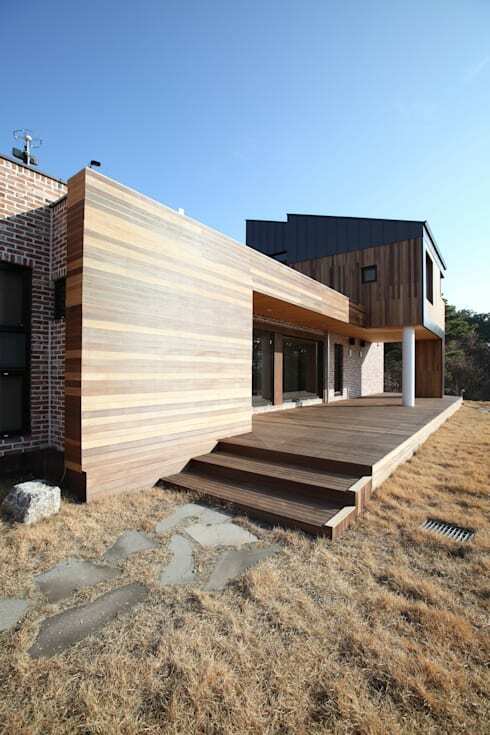 It features a wooden facade that works in harmony with brick and stone. The interspersing of glass breaks up the different textures and tones, which results in a very modern and appealing exterior design. The designers have played with the space available to them, building a single-storey home that flows up into a double-storey design on the one side. There is plenty of space for social and interactive spaces as well as more private areas including the bedrooms and bathroom. Do you see how the large glass windows and doors ensure that there is a constant connection between the inside and outside areas? If we look a little bit closer, we can see how little stairs lead up onto a wooden deck that can be used as a terrace. This is a warm and welcoming space that leads guests up to the large glass doors. Thanks to the upper-storey of the building, there is also a covered section of the terrace area. This is the perfect spot for enjoying the fresh air and sunshine as well as the gorgeous views. An area like this could be furnished with some durable, outdoor furniture including an outdoor table and chairs. This could be used for enjoying a cold glass of iced tea or a good book while relaxing outside. 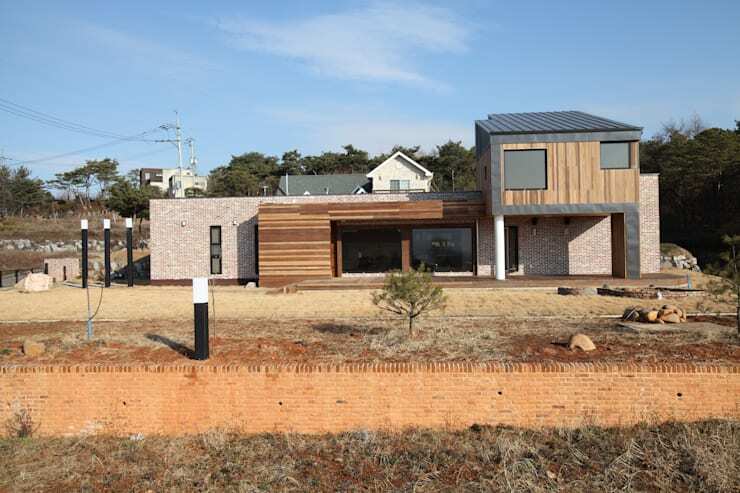 We can also see a little bit closer here how the beautiful wooden facade contrasts with the more rugged bricks, creating a very appealing design. 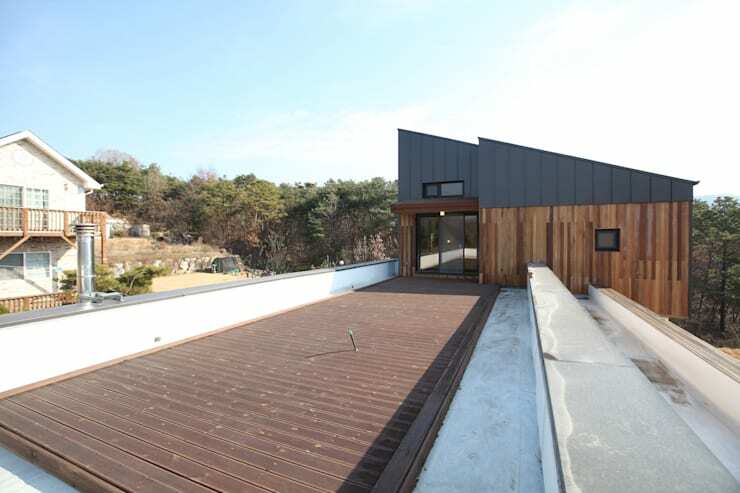 Thanks to the design of the home, the upstairs area can open up onto the roof, creating a whole new space to enjoy the views! The designers have used wood for this terrace as well. Wood is a wonderful material for an outdoor space because it is durable and lasts in all weather conditions. It also looks gorgeous too. If you have the space for a roof terrace, it's definitely something to invest in. It allows you an elevated area where you can truly enjoy the surrounding views. Have a look at these 7 wonderful roof terrace ideas for inspiration! The designers have gone for an open plan living area, where the kitchen, dining room and living room flow into one another. The kitchen is subtly separated from the rest of the home thanks to a little kitchen bar and the wooden dining room table that extends from it. 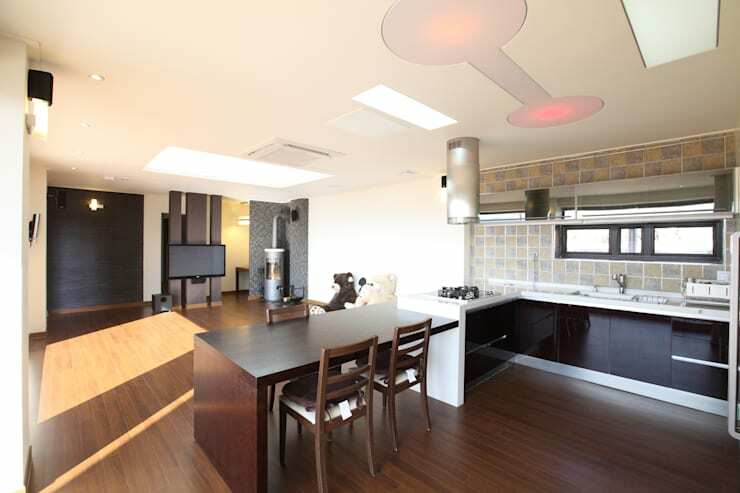 This is very functional and savvy, while still creating a very interactive living area. 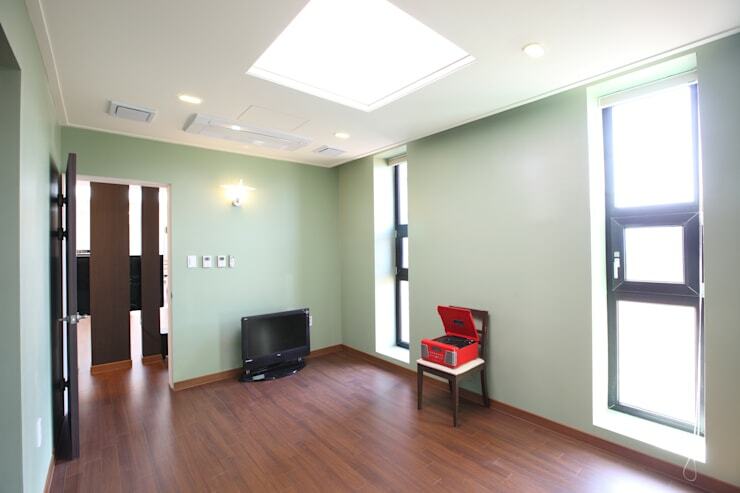 The designers have mixed materials in this interior design as well, with wooden floors and grey tiled walls. The sleek and white kitchen counters and black cabinets make for a very edgy design. Have a look at these 10 fabulous black and white kitchens for ideas on how you can bring these tones into your cooking space. In the living area, we can see what a big role natural light plays, working in harmony with the light wooden floors and white walls. The designers have installed a skylight in the ceiling, which is a very quick and easy way to ensure that your interior space is filled with light. The large glass windows and doors also assist. 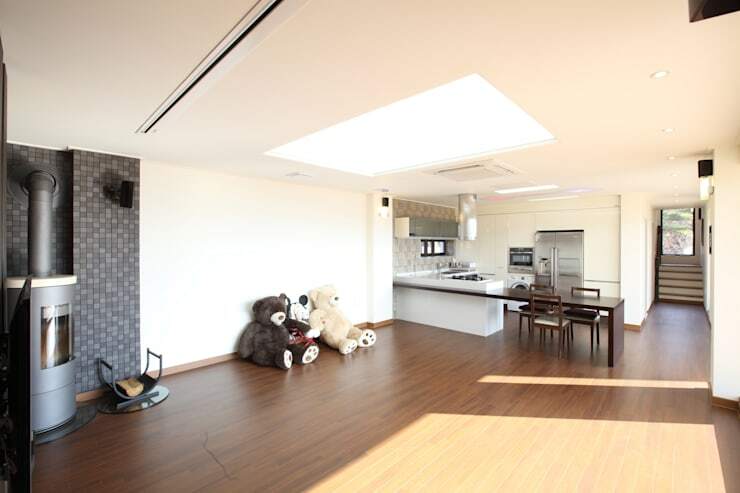 We can also see how a few personal touches add charm and personality to the space – namely the teddy bears in the room! Remember that your home is your oasis so it should feature items that speak to you and who you are. In this area of the home, we can see how the designers have painted the walls a pale mint green, which introduces a bit of colour and style to the space. Your walls are a great design tool to work with so don't let them be overlooked! There are just a few simple pieces of furniture in this space, showing how a minimalist design creates a very appealing look and feel. The designers have only included the most necessary and functional items in this space. This is a home that is simply gorgeous, introducing raw materials into a very contemporary design. Wouldn't you want to live here?